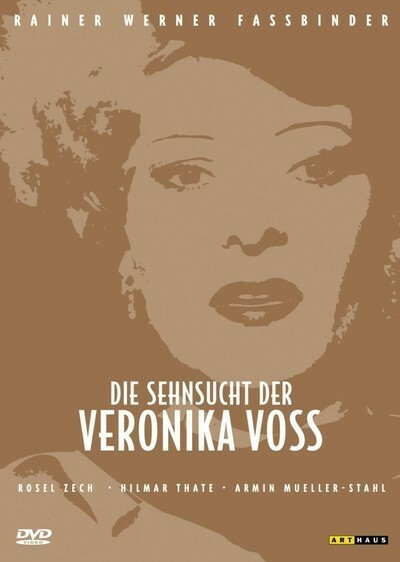 Rainer Werner Fassbinder premiered "Veronika Voss" in February 1982, at the Berlin Film Festival. It was hailed as one of the best of his 40 films. Late on the night of June 9, 1982, he made a telephone call from Munich to Paris to tell his best friend he had flushed all his drugs down the toilet — everything except for one last line of cocaine. The next morning, Fassbinder was found dead in his room, a cold cigarette between his fingers, a videotape machine still playing. The most famous, notorious and prolific modern German filmmaker was 36. Does this film represent a premonition of his own death? It tells the story of a German actress who worked tirelessly and achieved great fame, but began depending on drugs and alcohol and eventually became so addicted that she sold her body and soul for drugs. Her fortune spent, her marriage destroyed, she began to live as an inpatient in the clinic of a sinister Berlin woman who billed herself as a psychiatrist but was also a Dr. Feelgood who strung along her patients on morphine and controlled them by withholding their supply. Their arrangement was that after Veronika Voss's death, her suburban villa and its art treasures would be inherited by the doctor. The film opens in 1955 with Voss (Rosel Zech) looking at one of her own pre-war classics (that's Fassbinder himself in the audience, leaning on the seat-back behind her). There was a time when she was welcomed in the offices of producers, greeted by headwaiters, recognized on the street. That time has passed, and it is painful to hear her remind people who she is — or was. One night, drinking without funds in a cabaret, she falls into conversation with a soft-faced sportswriter named Robert Krohn (Hilmar Thate), who is old enough to remain under her spell. She grandly says she will pick up the check, then "allows" him to do it, and invites him to come home with her. All the furniture in her villa is covered in white sheets, the electricity is disconnected, and she has them light candles "because they are so much more flattering to a woman." The star struck journalist has without realizing it walked into the last act of Veronika Voss's life. Ending their evening suddenly, Veronika demands to be taken to the clinic of Dr. Katz (Annemarie Duringer), one of the stylish lesbians often found in Fassbinder films ("The Bitter Tears of Petra Van Kant"). This clinic could be imagined as the setting for a bizarre Fred Astaire dance number. It's all blindingly white — walls, floors, furniture, grand staircases, everyone's clothing. In an eerie touch, a wall of windows looks upon a waiting room, where other patients peer in needfully. Katz lives with a woman apparently her lover, and another constant companion is an African-American G.I. and drug dealer (Günther Kaufmann). This man is in the background of countless shots, never says anything, lurks when needed like a security guard, and was Fassbinder's sometime lover and an actor in many of his films (including the one he made just before his one, "The Marriage of Maria Braun"). We observe Veronika's frantic relationship with Katz, who berates her sadistically, and extracts details of the hours with Robert Krohn. Finally Veronika is shown to her narrow, cell-like room, and given the drugs she craves. In this room, and throughout the clinic, we hear incongruous American country & western songs ("The Battle of New Orleans," "16 Tons"). In "Maria von Braun," where Günther Kaufmann plays Maria's G.I. lover, similar music is heard, probably via Armed Forces Radio, a reminder of the presence of American occupying forces in postwar Germany. At Veronika's own "farewell" party, she performs "Memories Are Made of This," in a low, throaty torch-song voice perhaps intended to remind us of Marlene Dietrich. Indeed, Fassbinder's focus on Rosel Zech's reminds me of von Sternberg's Dietrich in "The Blue Angel." When Robert Krohn returns that day to his own apartment and girlfriend Henriette (Cornelia Froboess), he is almost proud to tell her where he spent the night, and she, also a writer for the newspaper, accepts this as an expression of his nature; she wants to know what Voss was like. Krohn, whose beat is hockey, convinces his editor he has lucked upon a major scoop about the decline and fall of a star. Throughout Fassbinder's work we find such figures, great stars, mannered, decadent, in various stages of their decay. This film was inspired by the real life of Sybille Schmitz, a German star of the 1930s who also fell athwart of a clinic supplying drugs. Many critics look at Veronika Voss and are reminded of Gloria Swanson in Billy Wilder's "Sunset Boulevard." Perhaps the association is intentional. When Veronika finally, with great difficulty, wheedles a bit part from her former agent, the director of the scene (Volker Spengler) wears glasses and has his hat pushed back on his head, Wilder-style. She only has two lines in her scene, but blows them again and again. She's rattled and craves a fix. She is watched by Robert Krone and by her ex-husband Max Rehbein (Armin Mueller-Stahl), who wearily explain to the sports writer that his former wife is a hopeless addict. Two other patients of Dr. Katz figure importantly: A sweet elderly couple named the Treibels. Their story figures tragically in the history of Germany, as you will find. The psychiatrist, indeed, seems poised at the center of a cynical web of postwar corruption, including drug authorities and the police; when they twitch the web, she senses it immediately. Fassbinder (1945-1982) was an immensely productive filmmaker. In his 37 years he directed 40 features, 24 stage plays and two long TV miniseries (notably "Berlin Alexanderplatz"). His death seems to have interrupted this flow in mid-stream. Powerfully influenced by the heavily stylized works of the German-Danish-American director Douglas Sirk ("Written on the Wind"), he may have worked at a feverish pace but his films always look carefully planned. In this film, for example, he evokes period b&w with a diversity of wipe shots, iris shots, pans, tracking, and the careful positioning of foregrounds. In other films he often uses zooms-in to underline dramatic points. His films are visually mannered, formal, and far from seeming improvised; the visual strategy of "Veronika Voss" suggests he was moving even closer toward the classic Hollywood style. What an impression he made when he was alive! At Cannes every year he seemed to have at least one film, and you would see him at Le Petit Carlton, the famous bistro behind the Palais du Festival, on rue Felix-Faure, behind the Hotel Carlton. Fassbinder and his posse would be gathered inside, close inside the doorway. looking as discontented as usual. In August of 1983 at the Montreal Film Festival, as his close friend the director Daniel Schmid and I both served on the jury of the World Film Festival, the ghost of Fassbinder seemed almost like another presence in the city, Fassbinder had attended the 1981 Cannes Film Festival, nine months before his death, I remember him at dinner, unshaven, defensive, always smoking, ignoring the food and ordering a bottle of Cognac to be placed before him. During the last weeks of his life, Schmid said, during those sad telephone calls at three in the morning, Fassbinder often repeated the same thing. "He would shout at me: How are you able to just sit there and look outside the window? How can you? How can you just sit on a rock and look at the sea? How can everybody else be so lucky?" "Veronika Voss" is on DVD in the Criterion Collection, and streaming on Hulu Plus. Also in my Great Movies Collection are reviews of Fassbinder's "Ali — Fear Eats the Soul," a re-working of Douglas Sirk's "All That Heaven Allows," and Sirk's "Written on the Wind." At least a dozen other Fassbinders are reviewed on this site.